Can yeasts be used to prevent protein haze? 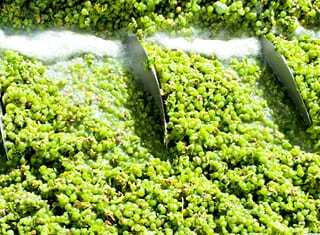 Winemakers add bentonite to prevent protein haze in white wines. Although this treatment reaches its goal, it also leads to volume losses and sometimes a decrease in wine quality. The question is: are there alternatives available? The removal of proteins is a key step during the production of white and rosé wines to avoid the possible appearance of a harmless, but unsightly haze. Haze formation is an aesthetic problem that consumers usually regard as a fault (e g microbial spoilage) leading to potential economic losses. Proteins that are responsible for haze formation in wine have been identified as pathogenesis-related proteins of grape origin. The most abundant class of haze-forming proteins are chitinases and thaumatin-like proteins and are continuously produced in the grape berry and even more so in response to pathogen attack. Because of their physical structure and properties, these proteins are very resilient and are not or poorly degraded during the course of fermentation. Over time and upon exposure to warm/hot temperatures during storage for instance, these proteins denature and aggregate into light dispersing particles resulting in what is referred to as ‘haze’. The mechanisms of haze formation has received much attention from researchers over the last decade. It is complex by nature and depends on several factors, one of the most important being the presence of sulphate. The removal of these proteins is usually achieved via bentonite fining, but several issues including volume loss, aroma stripping and sustainability have been identified with the use of this clay. Several strategies have therefore been investigated over the past few years. One of the most attractive alternatives would consist in degrading these haze-forming proteins with enzymes. This is particularly appealing since enzymatic degradation of proteins (protease activity) would not lead to any of the issues mentioned for bentonite and could have the additional benefit of releasing yeast assimilable nitrogen. Where does one find enzymes capable of degrading haze-forming proteins? Recently, new enzymes were tested in Australia and researchers discovered that aspergillopepsins from the fungus Aspergillus niger could, at least partially degrade haze-forming proteins at wine pH and temperature ranges. The treatment was effective when coupled to flash pasteurisation of the wine at 72°C for 1 minute and could significantly reduce the need for bentonite treatments. 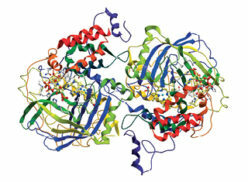 These enzymes are now commercialised in Australia and New Zealand under the commercial name Proctase. Even more recently, the search for this type of enzymes has extended to microorganisms naturally present within the winemaking process. For instance an aspartic protease isolated from Botrytis cinerea has been investigated in Australia for this purpose and it was found that this enzyme could effectively degrade grape proteins without the need of flash pasteurisation. This is indeed an advantage as the equipment required for flash pasteurisation, especially on a large scale, is expensive. The same idea of exploiting the natural properties of wine microorganisms was followed at Stellenbosch University. The exploration of the oenological properties of non-Saccharomyces yeasts isolated from grape juice previously led to the identification of yeasts displaying acid protease activity, as reported previously. In general, the inoculation of non-Saccharomyces yeasts together with or before inoculation of Saccharomyces cerevisiae provides an opportunity for winemakers to create distinct styles of wine and is actively investigated in several studies. So … does it work? 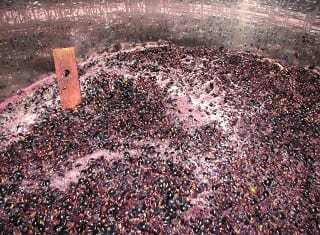 One strain of the wild yeast Metschnikowia pulcherrima, displaying strong protease activity, was isolated from grape juice at the Institute for Wine Biotechnology. The protease-encoding gene, named MpAPr1 (Metschnikowia pulcherrima aspartic protease 1) was also isolated previously. In order to assess whether the enzyme would be efficient to break down haze-forming proteins, MpAPr1 was expressed in another yeast, Komagataella pastoris, a common practice in research to collect and purify significant amounts of enzyme. It was found that protease activity was retained over a pH range of 3.0 to 5.0 and between temperatures of 10°C to 50°C. Ethanol had a strong inhibitory effect on protease activity. Indeed, at 6% (v/v) ethanol, up to 50% activity was lost. Sugars had a moderate inhibitory effect with concentrations as high as 300 g/ℓ only leading to a 40% loss in activity. All in all, these results suggested that, the enzyme should retain at least 50% activity in grape juice/first stages of alcoholic fermentation. The enzyme was purified and its activity against grape proteins assessed under optimal conditions for enzyme activity in terms of pH and temperature (pH of 4.5 and 40°C) and under conditions resembling those occurring in grape juice (pH of 3.5 and 20°C). The results (Table 1) demonstrated that MpAPr1 was more active under optimal conditions (as expected) where it was able to fully degrade chitinases, the main proteins responsible for haze formation in white wine. 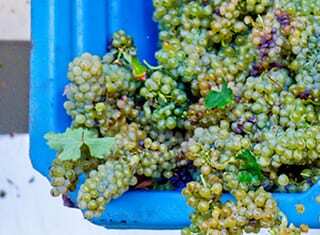 Under conditions occurring in grape juice, MpAPr1 degraded the proteins only partially, suggesting that a longer incubation period or a higher enzyme concentration would be necessary to achieve further degradation. Furthermore, residual activity assays revealed that the enzyme was more stable under winemaking conditions leading to no loss in activity, at least within the first 48 hours following enzyme addition. Finally, the overall impact of the MpAPr1 enzyme was tested in fermentation trials using Sauvignon blanc juice. The enzyme was added to grape juice and its impact evaluated after 48 hours of incubation after which S. cerevisiae was inoculated. Partial degradation could be achieved (especially for chitinases) and at the end of the fermentation period, a significant increase in specific volatile compounds produced by the yeasts, namely butanol, propanol and propionic acid, could be detected. This result further confirmed that MpAPr1 could degrade proteins leading to an increase in assimilable nitrogenous compounds which the yeast metabolised. However, MpAPr1 activity was too low to yield a significant break down of grape proteins and no reduction in haze-forming potential was noticed. The results of this study show that the protease secreted by M. pulcherrima is partially active in grape juice and can break down certain proteins, without the need for flash pasteurisation the juice. However, protease activity of MpAPr1 was limited and further experiments will be carried out in an attempt to (1) optimise the amount of enzyme and (2) assess whether the direct addition of M. pulcherrima would result in a sufficient amount of protease to impact grape proteins and ultimately the wine’s properties. The use of enzymes that break down proteins specifically would be ideal since other wine properties would remain untouched. While the Australians are investigating proteases from fungi (e g Aspergillus, Botrytis), we endeavoured to find out whether some wild yeasts associated with the grape/wine environment secrete suitable enzymes. After an extensive screening, certain strains of Metschnikowia pulcherrima were found to secrete such an enzyme. We therefore embarked on a project aiming at assessing its ability to degrade haze-forming proteins under the harsh conditions found during winemaking. The results showed that the enzyme was indeed able to degrade the target proteins, but that the low pH, low temperature and presence of some inhibitors reduced its activity. Nevertheless, factors such as incubation time and amount of enzyme added could still be optimised and there is thus hope that such enzymes can replace or at least reduce the need for bentonite in the future. The authors would like to thank Winetech and the National Research Foundation of South Africa (Grant specific unique reference number UID 88819). Lagace, L.S. & Bisson, L.F., 1990. Survey of yeast acid proteases for effectiveness of wine haze reduction. American Journal of Enology and Viticulture 41, 147 – 155. Dizy, M. & Bisson, L.F., 2000. Proteolytic activity of yeast strains during grape juice fermentation. American Journal of Enology and Viticulture 51, 155 – 167. Van Rensburg, P. & Pretorius, I.S., 2000. Enzymes in winemaking: harnessing natural catalysts for efficient biotransformations – a review. South African Journal of Enology and Viticulture 21, 52 – 73. Francis, I.L., Sefton, M.A. & Williams, P.J., 1994. The sensory effects of pre- or post-fermentation thermal processing on Chardonnay and Sémillon wines. American Journal of Enology and Viticulture 45, 243 – 251. Pocock, K.F., Høj, P.B., Adams, K.S., Kwiatkowski, M.J. & Waters, E.J., 2003. Combined heat and proteolytic enzyme treatment of white wines reduce haze forming protein content without detrimental effect. Australian Journal of Grape and Wine Research 9, 56 – 63. – For more information, contact Benoit Divol at divol@sun.ac.za.